We first began farming by producing high quality vegetables and fruit to a neighboring farmer who then took our produce to his farmers markets to sell to consumers. When this farmer passed on, we began searching for other ways to engage in farming full-time. In 2006, we began to attend several farmers' markets in Carroll County, Howard County, and Montgomery County. Our customers always remark on the great variety and high quality of produce that we provide. Meeting the numerous happy customers at the markets is one of our favorite things to do. In fact, many of them have become friends. Never to disappoint, the regulars always show up at our market stand to gather their favorite goods for the week, and each market day we meet new customers hungry for something better and new. While we love going to market and telling customers about our produce, we enjoy farming the most. 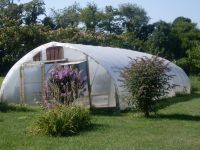 The CSA program allows us to get a better idea of how much to plant each spring as we prepare for the main busy season. Today, we have an ever-expanding products inventory (meat, vegetables, fruit, eggs,) to meet the needs of our growing family of customers.